Ukraine's Prosecutor General Yuriy Lutsenko in an interview with the Washington, D.C.-based The Hill publication said U.S. Ambassador to Ukraine Marie Yovanovitch gave him a list of persons who should not be investigated. However, Lutsenko said he considered it inadmissible to comply with the suggestion. On Thursday morning Lutsenko's Spokeswoman Larysa Sarhan on Facebook released four fragments from Lutsenko's interview and confirmed to the Kyiv-based Interfax-Ukraine news agency that Lutsenko indeed gave an interview to the Hill and in one episode he talked about such a list. "Unfortunately, from the first meeting with the U.S. ambassador in Kyiv, [Yovanovitch] gave me a list of people whom we should not prosecute," Lutsenko, who took his post in 2016, told Hill.TV last week," The Hill quoted Lutsenko as saying. "My response of that is it is inadmissible. 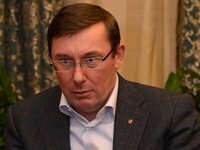 Nobody in this country, neither our president nor our parliament nor our ambassador, will stop me from prosecuting whether there is a crime," Lutsenko said, according to The Hill. The Hill writes that the U.S. Department of State called Lutsenko's claim of receiving a do not prosecute list, "an outright fabrication." There have been no official statements about which names could have been in the list given to Lutsenko by Yovanovitch, and Interfax-Ukraine has not received it. An informed source told the agency that maybe persons loyal to the U.S. embassy in Ukraine were included in it.